A tidal wave of photographs is uploaded to the Web every day – some without a second’s thought to privacy or quality. Vevey Images festival accompanies photography’s new grey areas and shows us where it is headed in the digital age. “We are always in somebody’s lens,” says Stefano Stoll, director of Images. At the helm since 2007 of an open-air photography event that every two years transforms the lakeside city of Vevey, he observes that it has become more and more difficult to escape being photographed. But Stoll is not interested in pictures as documents of reality. 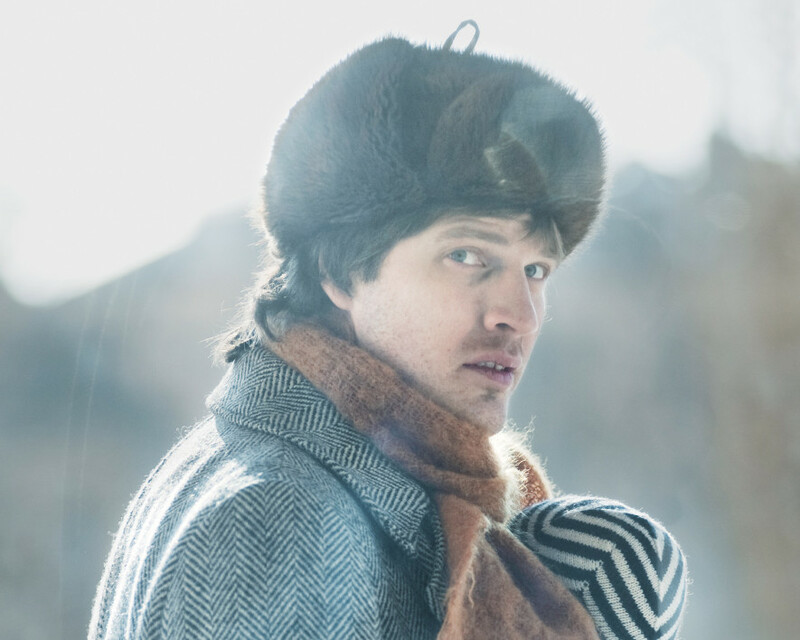 Images’ director remains politely indifferent to the narcissist appeal of selfies that really only say “I was there”. Instead, his festival observes where photographers are taking photography, but with an added twist: the town of Vevey becomes a laboratory to present the images in an urban context. Buildings are transformed into monumental billboards, tunnels become storyboards, parks allow scenes to blossom like flowers and now, for the first time, rooftops become beaches. “The question we are asking ourselves is: What is photography today and what will it be tomorrow,” he explains. Stoll is a great believer in the narrative power of images, their capacity to tell stories, which Images then enhances by placing them in a surprising environment. 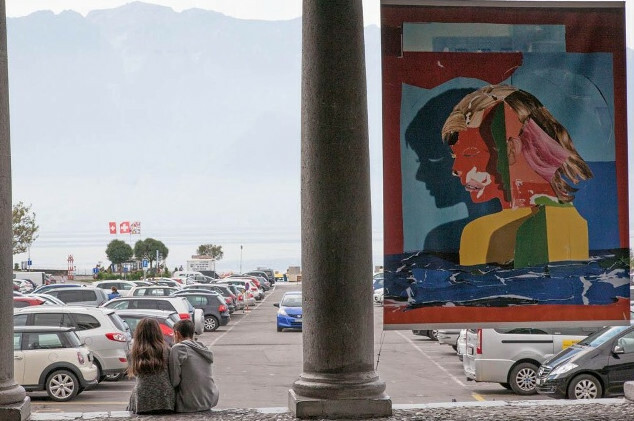 ‘Man with vertical lines’ by John Baldessari, the renowned American artist considered the godfather of conceptual art, is be displayed four-stories high on the walls of the former Vevey prison, a link that makes Baldessari smile. Photographs of unsuspecting sunbathers secretly taken by Latvian photographer, Tadao Cern, with a camera perched at the tope of a pole on his back are spread like towels on the rooftops of Vevey, away from the public eye. 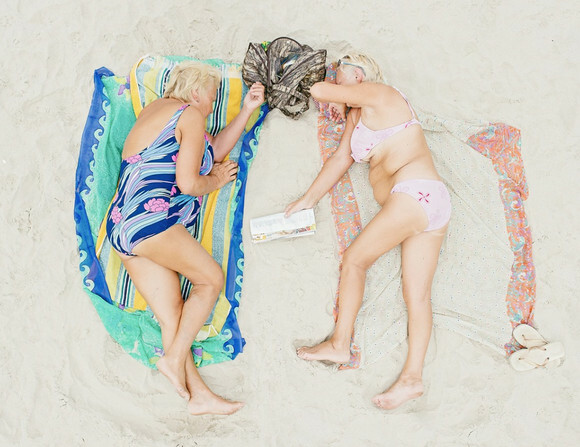 The sunbathers are then observed from ground level by spectators who look at them through the eyes of a drone. ‘Comfort Zone’ by Tadao Cern. Sunbathers who didn’t know that they were being photographed are secretly observed by drones in Vevey. “This is a world premiere,” Stoll claims of the use of civilian drones in art. “Drones are the ultimate assault on our privacy,” he says, admitting that the festival adapted the project at the last minute due to recent legislative changes in Switzerland. Capturing high definition moments of unwary subjects is the theme of another major Images project that also touches upon the frontiers of privacy. From behind a two-way mirror in “Watching you watch me”, Swedish photographer Moa Karlberg captures the fleeting glance of passers-by as they recognise themselves in a mirrored window. None smile. Displayed in a shopping arcade, the larger-than-life portraits are backlit at night, which adds to their eerie indiscretion. The festival is clearly flirting with danger, Stoll admits, because “we are violating the intimacy of these people”. He is however convinced that privacy is an important contemporary issue that can benefit from being presented “in a fun and unexpected way”. 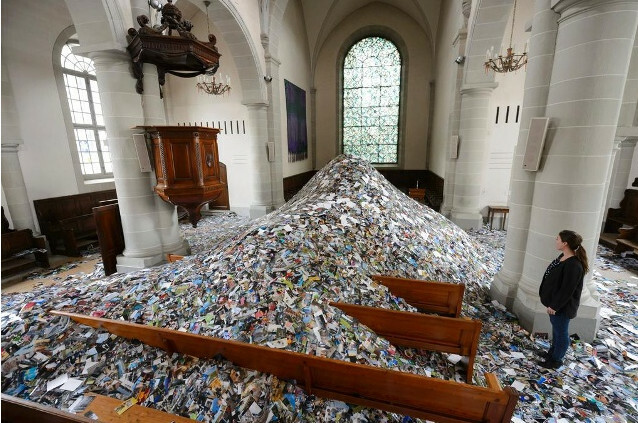 Dutch artist, Erik Kessels (see front picture) printed out 350,000 photographs up-loaded to Flickr on a single, random day and has strewn them in piles throughout Sainte-Claire church in Vevey, where visitors can pick them up, have them commented, and keep them. Media historian and visual sociologist Gianni Haver echoes Stoll’s views. The Lausanne university professor confirms that images are a means by which a society tells its own story and has done so since the dawn of humanity. Narcissism reflects our desire to be present in more than one copy, like an image admiring itself in the mirror. On the other hand, because “social media provides social relationships without the physical contact,” we are tempted to reconstruct our identities in the same way as we choose different clothes every morning. “We are painting with pixels,” Haver says. To illustrate the ease of virtual transformation, he mentions the example of a slice of pizza that is visually transformed before our eyes into a beautiful girl wearing a red bikini. When we put images on the web, we allow our private spheres to go public, he points out. But unless we are the object of a search, we become tiny drops in an ocean of indifference. It is therefore not surprising to Gianni Haver that the impermanence of images on a floating screen is actually contributing to reviving an interest in the printed picture, that can be shared as a physical experience, which is exactly what Images festival does. So, how can professional photography compete with the flood of amateur photography on the web, I asked Léonore Veya, Dean of photography at Vevey’s CEPV, one of the two major photography schools in Switzerland (the other is in Zurich). In her view, the two are not comparable. Students in photography learn to express much more than a shot of reality can convey. To illustrate the wealth of personal interpretations that even a universal theme like the relationship between man and animality can inspire, 56 artists involved with the school have been invited to take part in a special exhibition that takes place during Images, the mysteriously named Hordes et Nuées (hordes and swarms). The show has been beautifully curated by Danaé Panchaud and Myriam Ziehli to reveal powerful and sometimes disturbing associations. Veya does not dismiss the means for self-expression that the Web has provided, but points out that images need to be filtered or contextualised. This is what trained photographers can provide, which is the reason she remains optimistic for the future of photography. “Without a point of view, there is no information,” she suggests, adding that several points of view create a visual symphony. She also points out that art genres are no longer impermeable and that visual artists often use photography, just as photographers frequently turn to video or find a way of integrating the web into their practice. “Photography lends itself to hybridisation,” she affirms. “It is not because the tools have changed that our entire past has disappeared,” she says to explain a revival for photographs in print and books; they give photography a permanence that the web cannot offer. 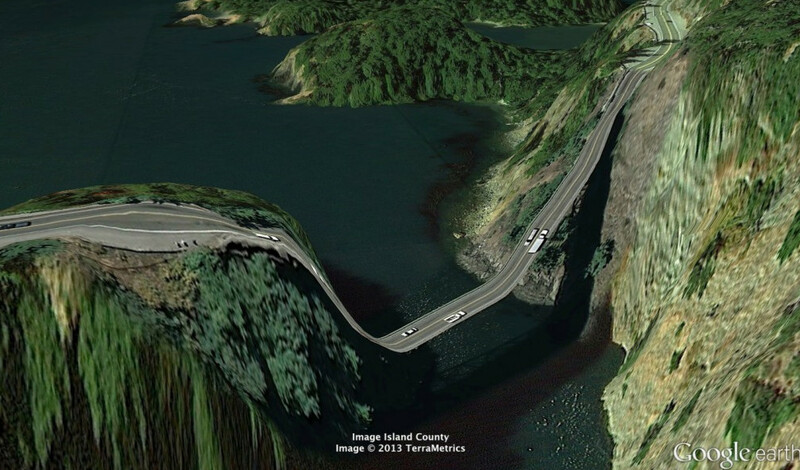 ‘Postcards from Google Earth’ by Clement Valla demonstrate the hilarious limitations of algorithms to translate real-life topography. ‘Texting Syria’ by Liam Maloney. 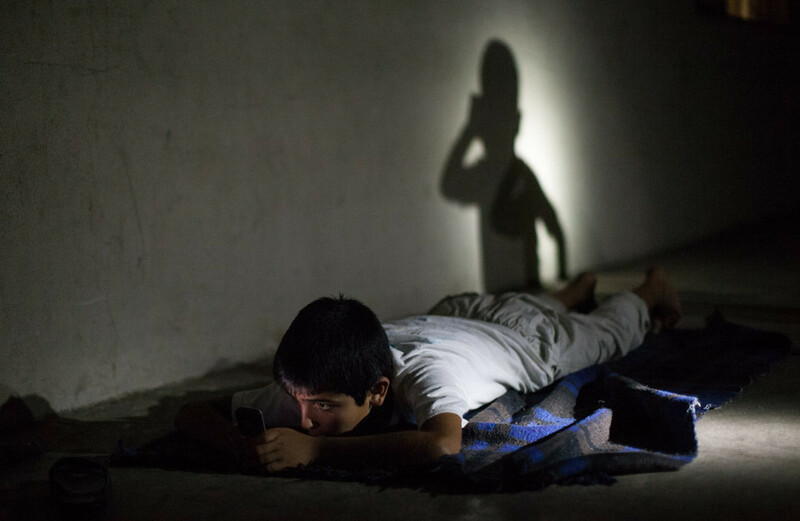 Syrian refugees are caught in the light of their phones as they text messages to their families. Those messages can be relayed to the phones of the visitors of the expo and are heard as a gentle hum in the background of the underground shelter in Vevey. ‘Silvermine: au bord de l’eau’ by Thomas Sauvin. 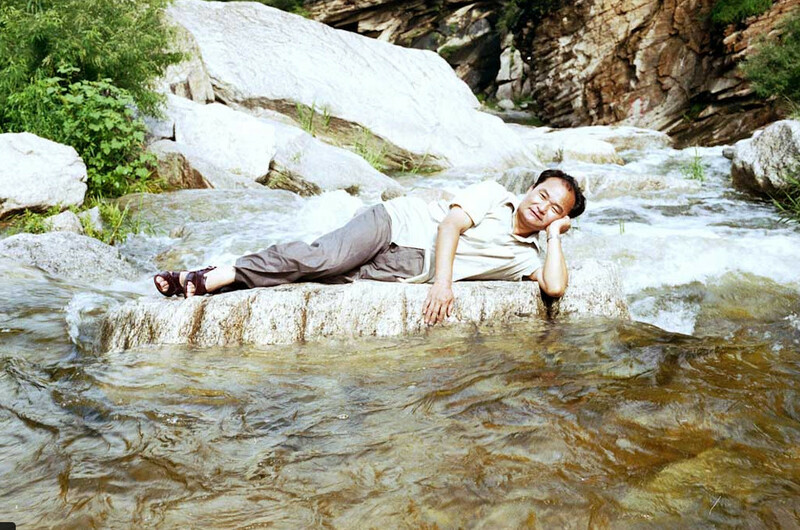 A French artist/collector secures, develops and exposes abandoned negatives of photographs made by unidentified Chinese nationals discovering the pleasures of leisure and water. 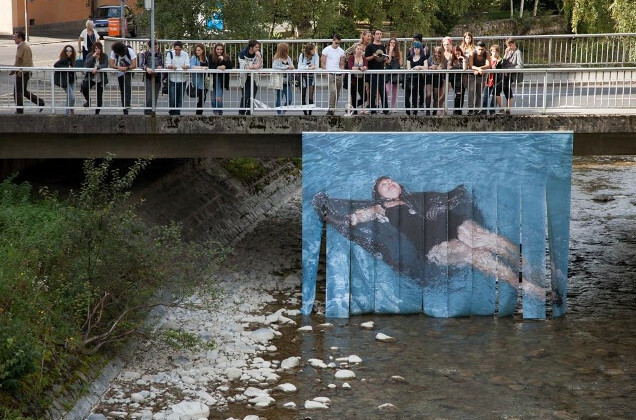 Images is an entirely free outdoor festival of the visual arts that takes place every two years in Vevey, on the shores of Lake Geneva. This year’s edition, on the theme Mirrors, reflections and pretence, runs until October 5, 2014 and includes 68 projects by artists from 18 countries, as well as exhibitions by the five laureates of the Vevey International Photography Award (out of 800 submissions). Vidy Theatre in Lausanne collaborates this year with a powerful project on Beirut. The monumental tarpaulin picture canvases draped on the buildings during one edition are recycled into shoulder bags and purses that are sold during the following edition. Invasions of privacy are the subject of a recent article in ARTnews entitled ‘When does surveillance art cross the line’. Author Barbara Pollack gives examples in the US where the court has ruled in favor of photographers who have taken pictures of people in their intimate environments on the grounds that they were not identifiable and that the pictures were not used for commercial appropriation, i.e. advertising. And once the pictures are posted on the Web, Google, Instagram, Flickr, Twitter and other internet companies have asserted the right to possess the material. Pollack points out that the younger generation considers the loss of privacy as a price to pay for being connected to a digital network. Interviewed for the purpose of this article, a 26-year-old shrugged his shoulders and said that privacy is a concept of the past. He is convinced that unless one is a celebrity, or someone has a reason to look for us, our details are diluted in a sea of information. Before Internet, he mused, figures such as those in ‘Kiss by the Hotel de Ville’ by Robert Doisneau, Robert Capa’s ‘Falling Soldier’ or the Afghan girl with green eyes on the cover of the National Geographic, became icons overnight but remained anonymous. With the Web, they would have nowhere to hide.